Understand that most cover letters do not get read. It is only after some level of interest in you is established that your cover letter might get read. Regardless, it is always a good job search strategy to write a well-crafted and persuasive cover letter. Doing so immediately differentiates you from other job seekers by highlighting strong points in your background, providing a sample of your writing ability and shows initiative – you made the effort to write a letter when other job seekers did not. Mention the name of a personal or professional reference, if you have one. Come out swinging with one of your top achievements. Identify yourself with a unique or sought-after skill or knowledge base. Refer to a business statistic that would be relevant to the employer. Mention a recent company event or news release that is significant. State your letter by quoting a recommendation or positive statement in your past performance reviews. The accomplishments paragraph is important now that you have created interest and matched a known company role. This is where you tell them how good you are or how uniquely qualified you are. Candidate must have at least ten years’ experience managing multisite locations Individual will have experience with the following: process management systems, personnel management, performance improvement, and emergency response plans. Managed four manufacturing facilities in four separate regions of the country. Exceeded production and profit goals for the last five consecutive years. Designed and implemented a process management system that resulted in improved production efficiency by 32 percent and increased product output by 20 percent. absenteeism of workers by 15 percent while improving productivity per worker by 21 percent. In this paragraph (Should you decide to include it) you have a fair amount of latitude on what information to mention. Choose topics that are relevant or impressive to the employer. This could include a strong achievement, a recommendation, a professional insight about yourself to personalize the letter, or a piece of information relevant to your job search such as relocation. Based on my track record of successful operational efficiency, I believe that I have the qualifications and accomplishments to make a positive impact on ABC Inc. I look forward to discussing this opportunity with you and I will contact your office next week. By following this cover letter success formula, you will have a well-crafted and persuasive cover letter. It will differentiate you from other job seekers. Once constructed it can serve as a customizable template for different job opportunities. During a job search, all you are looking for is the one – “right” – job offer. To achieve that goal, you will have a lot of interviews. If you are successfully conducting a proactive job search, you will likely have several interviews with several companies. Factor in disappointment and rejection as an inescapable part of the process. Hold onto the fact that you only need one offer, the right offer, from the right company and your mission is accomplished. Realize that there will be employers that will pass on you or you could pass on them. It’s all a process of elimination from employers and you. Eventually, everyone gets an offer. It’s a matter of time and the selection process – yours and potential employers. As a recruiter, I have told hundreds of candidates that an employer is going to pursue other candidates, or the job went to “the other candidate.” When that happens, I frequently tell those candidates that the time will shortly come when they will be the selected candidate and the others will not be getting the offer you are going to receive. Those are more than words of comfort…its truth. It’s remarkable how often things seem to just work out, especially for those job seekers who persevere and don’t allow disappoint and setbacks to derail their job search. Just remember, all it takes is one. Get (and keep) your emotions in check. This is the first order of business. If you need a day or a weekend to work through the emotions of losing your job before starting your job search, that’s fine, but no more than that. You don’t have time for a pity party! Now here comes the big secret: the moment you start taking real action steps to begin your job search, the sooner the feelings of anxiety, fear, and even anger will fade. Not dwelling on the past moves you forward to your future and your next job. Identify your keywords. What words apply to you? Start simple. What titles have you held? What industries have you worked in? What knowledge do you have? These concepts and others will form the messaging behind who you are and how you present yourself to the job market. There will be much more on keywords in The Motivated Job Search (2nd ed.) book. Get organized. You will need to make lists—of companies, people, and to-do lists. Think through how you will keep track of everything. Relying on your memory or sticky notes in a shotgun fashion is a recipe for disaster. In the thick of your job search, you won’t be able to keep track of what you’re doing without a system. Excel spreadsheets are highly recommended for creating lists of companies and people. Only create columns for the information you will really need (name of contact, company, company website, email address, phone number, date contacted). Don’t get carried away recording non-useful information. There are commercial services that can help you stay organized in your job search. Check out JibberJobber (www.jibberjobber.com) and CareerShift (www.careershift.com). Microsoft Outlook’s calendar feature can also help. You can record tasks to be done, schedule follow-up calls, and so on. Create a short list of target employers you would be interested in working for. It may be only three, five, or ten companies to start with. Add to the list as you discover new companies. The point here is to start the list that gets you thinking. Now, look up the companies on LinkedIn. Follow them by setting up alerts for news, press releases, and job postings. Google Alerts may also be used. If you have Twitter, follow the companies. This starts the flow of information from these companies (and others you’ll add), including jobs and industry trends, which will benefit your job search. Add this information to your Excel spreadsheets to create a complete picture of each company before moving ahead, to eliminate needless backtracking for additional research. Create a short list of networking contacts. This one is like the list of companies from the last step. Make a list of close professional colleagues you feel comfortable speaking to about your circumstances and job search. As you think of more, add to the list. This list likely will not exceed twenty to twenty-five names to begin with (although it could be more). After you make out the list, do not contact them. You are not ready (even though you may think you are). Regardless of your business or personal relationships, don’t “blow it” by not being properly prepared. Be patient. Read the Professional Networking section of The Motivated Job Search (2nd ed.) and do things right the first time. Update your resume. Either prepare one yourself or seek professional services (which will free your time for other job-search activities). Having your resume professionally prepared could be a good investment. Update your LinkedIn profile and expand your network. 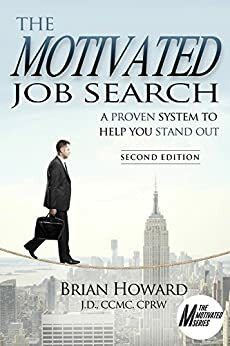 The Motivated Job Search (2nd ed.) book discusses LinkedIn at length and how to optimize your profile by leveraging the programming and algorithms. Make sure your resume and LinkedIn profile are in sync with each other (especially the names of former employers and dates of employment). Expand your network by adding one hundred new connections (it’s not as hard as you may think). These have to be the right kind of high-value connections (explained in the book) that will significantly advance your job search. Create job alerts. Use websites like Indeed.com and SimplyHired.com. You can choose to be alerted about titles, locations, specific companies (from your short list), and so on. Set up job alerts on LinkedIn too. Companies (and recruiters) post jobs on LinkedIn and you can receive notifications when they do. Are there any industry-specific or niche job boards you could search? Get a sense of the job market, and start the flow of opportunities you are looking for. If a position pops up, and you’re interested, do not apply for it through the website. Research the likely hiring executive(s) and contact them directly. This strategy is discussed in The Motivated Job Search (2nd ed.) book. It is imperative that you craft a professional brand that announces your distinct talents and what you represent to the marketplace. The process of branding is discovering who you are, what you are, what are your unique abilities, and communicating them through various mediums to your network or target market. You will differentiate yourself from other job seekers, and gain a huge advantage. You create the initial impression the employer has of you. You can more quickly convey your value to the employer. You can more easily match your skills and value proposition to the employer’s needs. You can better determine which opportunities to pursue. The drawback of not having a professional brand is simple: you are an unknown, you become ordinary or a commodity. Employers will determine for themselves what they want to see in you. They will cast you in a light based on their own conclusions, which may not be the message you want to communicate. There is no perceived differentiation from other job seekers. And, you cannot command a premium, and have reduced leverage when it comes to compensation. Perhaps the biggest benefit of creating a professional brand is the self-awareness of your unique skills and experience, and recognition of how they work together to create an impact. You will project the value of your abilities more clearly, resulting in a job that’s a good match for your skill set. Branding can also help you set your sights on what you want your future career to be. Additionally, when your networking contacts know your brand, they are much more likely to advance it for you through referrals, recommendations, and so on. When the right opportunities come along, you become top of mind (because of your brand). The professional-branding process is written about in The Motivated Job Search (2nd ed. )The process starts with introspection and thoughtful reflection. In some cases, thinking through your branding can be both an emotional and a professionally enlightening event. Think of it this way: as a job seeker, your goal is to connect with employers both intellectually (you can do the job) and emotionally (you’re a good fit). Having a well-crafted, professional brand helps on both levels. You must be perceived as the right candidate, and through branding you are better able to align yourself to an open job position. Keep in mind that the effectiveness of your brand is determined by the connection that exists between what the brand claims and what it can actually deliver. In other words, you must be able to prove and quantify your professional brand. Failing to do so will have disastrous results. Don’t oversell your brand and capabilities. Create a succinct brand. Think of it, in analogous terms, as a tagline or a theme that will be the foundation for your job search. What am I good at or an expert in? What have I been recognized for? What is my reputation with others (subordinates, peers, senior management)? What have been my strong points in past job reviews (if applicable)? What differentiates me from others with the same job? What professional qualities do I have that make me good at my job? What are the professional achievements I am most proud of? Award-winning sales executive with experience in workers’ compensation, pain management, consistently exceeding sales goals. Operations executive dedicated to improving operational efficiency through effective leadership. Client-focused account manager focused on client satisfaction and retention. Experienced attorney protecting ERISA fiduciaries from the Department of Labor. The purpose of branding is to get you known for the value you offer, get you in the door, and differentiate you from other job seekers. Conducting a job search while employed poses notable challenges. You’ve concluded that it is time to find a new opportunity, but how can you conduct a job search without raising suspicions? To ensure that your confidential job search does not raise red flags with your current employer and work colleagues, follow the suggestions below. Be aware of your behavior. You may have intellectually and emotionally “turned the corner” at your current employer. But do things just like before and go out of your way to defuse suspicion. Keep your current job a priority (you owe that to your employer) and finish strong. Resist the urge to tell coworkers of your intentions (which may not be easy), and do not use your employer’s computer equipment or email for your job search (use your personal email, even if you have to create one). When you network (as you will and should), let your contacts know about the confidential nature of your search—they’ll understand, but they must be made aware first. You should arrange similar confidentiality with recruiters at search firms. Recruiters can be great eyes and ears for new opportunities, and they are trained to keep dealings confidential. Update your LinkedIn profile. You need to update and optimize your LinkedIn profile (taking full advantage of the programming and algorithms of LinkedIn). However, depending on the changes you make to your LinkedIn profile, they could be broadcast to your network connections and raise suspicion. To hide your changes on LinkedIn, go to your Profile page and turn off “sharing profile edits.” That is done through the Settings & Privacy tab of your account. Be careful about asking for employment documents. Requesting copies of past performance reviews, covenants-not-to-compete, and the like are unusual requests. Some employers (thankfully) have policies to keep requests confidential when Human Resources’ channels and protocols are properly used. Hopefully, you kept copies of these documents and you do not need to ask for them. Be aware of telephone communications. Avoid having job-search telephone (or cell phone) conversations in the office, especially in open spaces. Go to a conference room and close the door (keep your voice down), go out into the hallway, outside, or to your car. And keep conversations brief. The wrong set of words overheard by the wrong person will blow your cover. Inform potential employers that your search is confidential. In your first conversation with a potential employer (HR or the actual hiring executive), state that you are currently employed and your search is confidential. This puts the topic on the table, and every employer will understand. Do what you can to schedule interviews (of whatever nature) early in the day, during lunchtime, or after working hours. If you happen to be a remote employee, you have more flexibility, but don’t take advantage of your flexibility to conduct a job search on company time (and dime). As your search progresses, you will likely need to take a day off (PTO or paid vacation) for longer, more involved interviews. Try not to take too many PTO days too close together. Your sudden disappearances from the office may create suspicion. Be aware of your attire. If your office dress code leans more toward business casual, showing up in interview attire is a sure tip-off. This may require you to change clothes before returning to the office after an interview. Anticipate that your confidential job search will eventually become known. Plan on your confidential job search being discovered by your coworkers, boss, or others, despite your efforts. Think about what you will say (in advance) if a coworker or boss confronts you. Be honest. Get a short answer together and memorize it. Getting caught by surprise and stumbling through an explanation is the embarrassing alternative. You could say: “Yes. I have been approached with another opportunity, and I thought I needed to explore it, just as you would if the circumstances were reversed.” The phrase “if the circumstances were reversed” often squelches a detailed conversation on the topic. Searching for a job while employed is not illegal, unethical, or immoral. It is similar to having a part-time job. Just be aware of what you are doing and how it is seen by others and you should fine. For more information check out The Motivated Series of job search books.